For my first “official” post I figured I’d make something from my crockpot board on Pinterest. 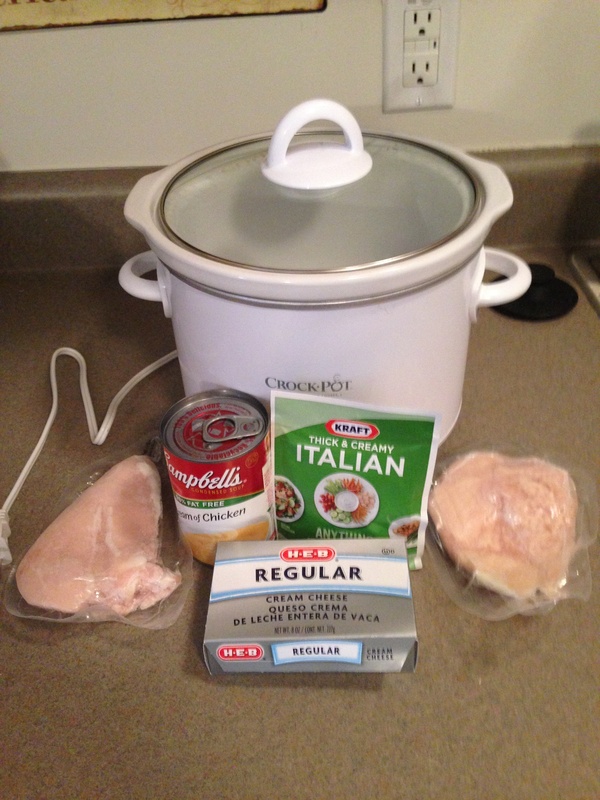 I received a Crockpot for Christmas, and had been eyeing this recipe for a while, so I finally wanted to make it. I pinned the Italian Cream Cheese Chicken from the Recipe Critic, and with only 4 ingredients it looked really simple to make. 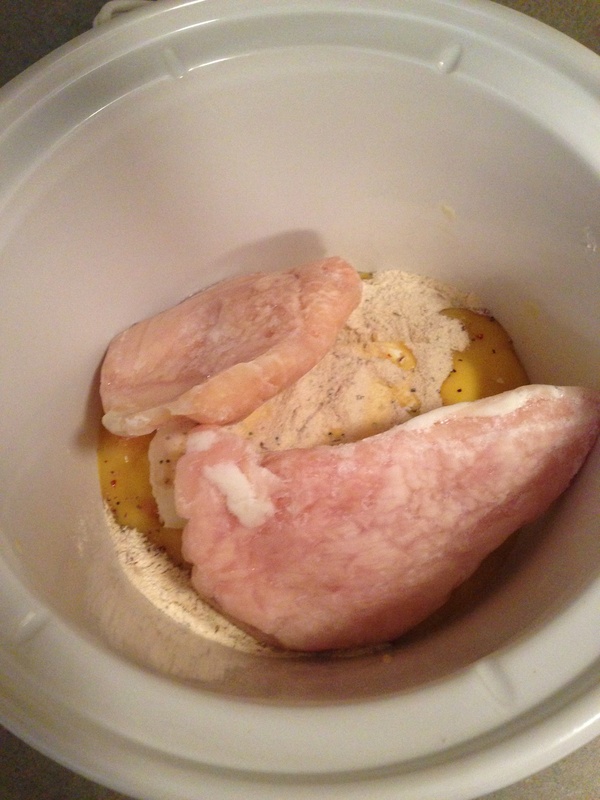 The recipe called for: 4 chicken breasts, 1 packet Italian dressing seasoning, 1 8 oz. cream cheese (softened), and 1 can cream of chicken soup. I started the process at 1:45pm by first turning my Crockpot on low and putting in the cream of chicken soup, followed by the cream cheese, then the italian dressing seasonings, and finally the 2 frozen chicken breasts. I ended up using 2 chicken breasts instead of 4, because I have a smaller Crockpot, also because I was making this dish for 2 people. I cooked everything on low for 5 1/2 hours, and made sure to stir every hour or so. By almost 7pm I took the chicken breasts out, and shredded the chicken with two forks. The chicken was so tender it completely fell off of the fork when I took it out of the Crockpot. I did a taste test and it tasted WAY too thick, so I added enough water to thin the recipe out. 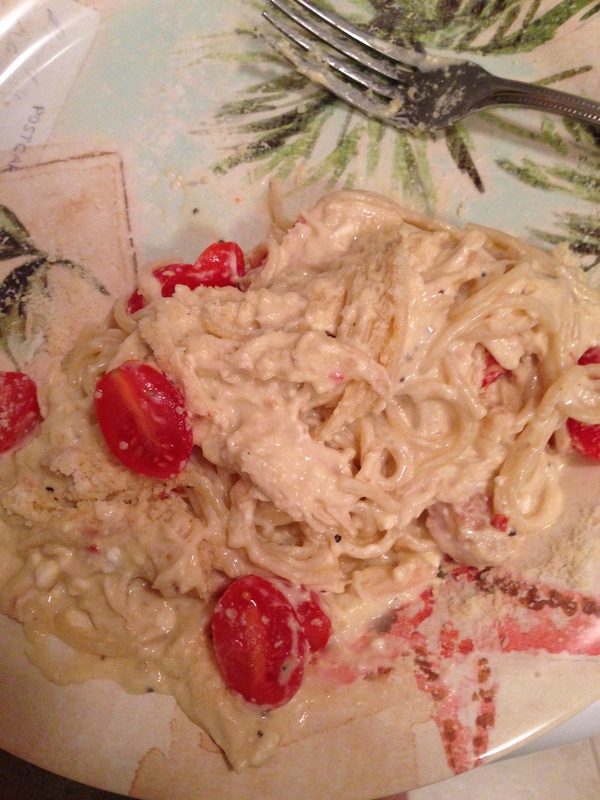 Finally I cooked spaghetti noodles, chopped up some cherry tomatoes, mixed the italian cream cheese chicken with the noodles and tomatoes, and finally I added some parmesan cheese on top. My review: Overall, I found the recipe to be pretty tasty. I was disappointed with how strong the cream cheese flavor was at first, but when I added the parmesan and tomatoes it definitely helped. If I made the recipe again in the future I would definitely use less cream cheese, other than that the recipe was quite tasty!